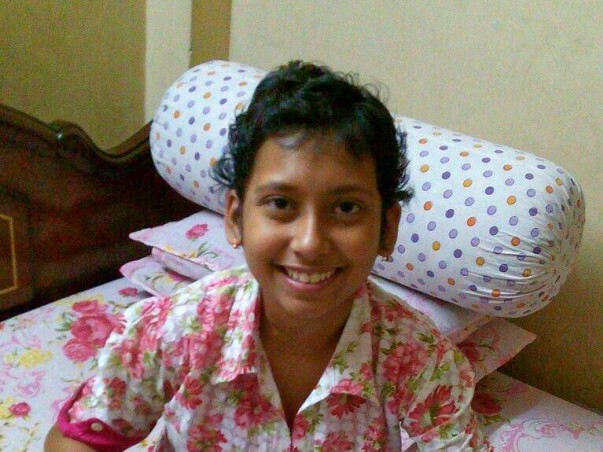 Help Sreeja to win the battle against cancer. Sreeja was born in 09-12-2004. We were so happy to get her. Gradually she grew up and we admitted her to school. Not only we, she was also very happy to going school. Suddenly, the day came on 11-10-2009. On that day, she was diagnosed with T-cell Acute Lymphoblastic Leukemia (a form of blood cancer). We could not find anyway but had started her treatment. She tolerated the treatment well. We have only 3 followups remained but unfortunately, in August 2015 it has been relapsed. Everybody was shocked and treatment started again with heavy doses of chemotherapy. The main treatment was 6 months and she also tolerated well it as well as radiotherapy also. 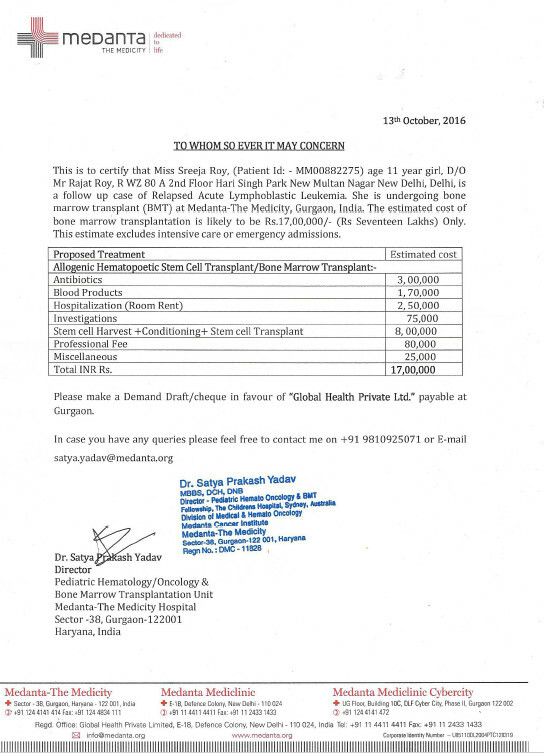 Now, the time came on 29-09-2016, her disease relapsed again and the last option is BONE MARROW TRANSPLANT which would cost INR 17 Lacs . I work in a medical transcription company at an annual salary of Rs. 4 Lacs. I am only working member in the family and this is a huge amount for me to raise. But I have to get treatment for my daughter and hence I am looking for your prayers, wishes, and fundings. please bless my daughter this Diwali. Thank you for sparing a thought, a prayer and your resources for helping sreeja. She had a tough last month where she had suffered infection in her blood and had to stay in ICU for couple of days. She is done with her chemotherapy and now due for bone marrow transplant on 23rd January. Post which she would be monitored very closely till 6 months and would be in and out of hospital. We are still short of funds and trying through PMO and other NGOs. from bottom of my heart, thanks very much. Keep her in Prayers.